Lie Down With The Dogs, Get Up With A Black Eye? The first game of the soccer season was yesterday, the Over-30 Division C League, that is. I brought the camera to get some action shots, but I was not that quick on the draw. I ended up with shots of guys standing around waiting for the ball to come to them. The best part was when Steve shoved an opposing player for no reason, causing the crowd to call him a "hot head". Turns out that the ball smacked Steve in the eye and he was pushing the opponent from him because he couldn't see. Of course, I missed that shot, too. The Dirt Dogs (Steve's team) lost 2-1. 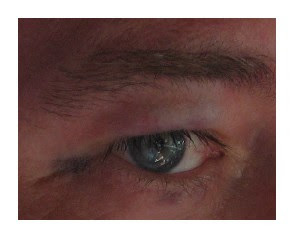 Steve walked away with a cool black eye, instead of some lame non-visual and therefore not very believeable injury.